Ah yes, that's Russian for Adventures of Sherlock Holmes and Doctor Watson, the early to mid-80's Russian tele-film series that was apparently one of the cornerstones of entertainment in erstwhile Mother Russia. I had heard of this series some time ago, especially the high praise given to Vasily Livanov's portrayal of Holmes and the faithfulness to the original stories. 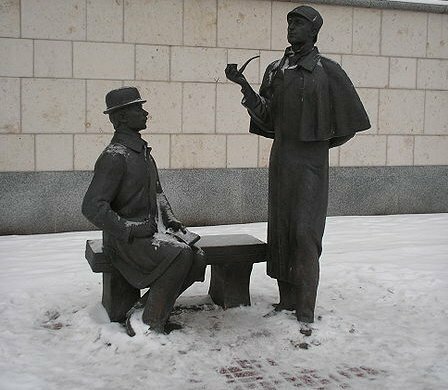 In Moscow they have a statue of Holmes and Watson (Vitaly Solomin) cast in the likeness of the actors from this series, and Vasily was given an honorary OBE. At long last I have an opportunity to actually try this out. I just saw the first episode (An Acquaintance), which takes the meeting of Holmes and Watson from A Study in Scarlet, then nicely segues into the plot of The Speckled Band. I can understand the logic behind that since the plot of A Study... is too lengthy to be respectably contained in an hour-long episode, and this provides a nice complete-in-itself introduction to our Baker Street companions. If the quality of the first episode is any indication, the production values are quite nice with a modest but pleasing representation of Victorian London (actually shot in Russia). Of course, what would interest many of you is the portrayal of the lead characters. Sherlock Holmes fans have read the original stories several times over and each has a crystallized image of the gaunt detective and his loyal "friend and colleague". 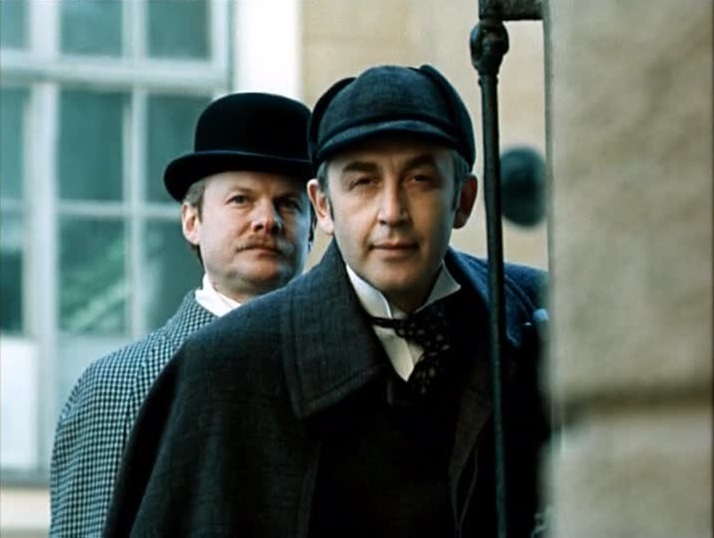 Many actors have portrayed Holmes in various adaptations, and Vasily Livanov's name can stand proud with them. Unlike most actors in the pre-Jeremy Brett era, including the respected Basil Rathbone and Peter Cushing, who portrayed Holmes as a brisk rather chummy avuncular chap, Vasily brings languor, moodiness and a hint of arrogance to his performance. It's not the full-blown baroque theatrics with which Jeremy Brett would astound and endear himself to Sherlock Holmes fans and redefine their image of the character, but it is interesting. Dr. Watson is also in good form at least in this first episode. His initial reaction to Holmes is one of suspicion and antipathy, and at one point, don't ask me how, they have an indoor boxing bout. While they get around rather soon after that, I am hoping this is an indication the Watson of this series will not be a mute spectator or a bumbling clown. I will get back when I have sampled more of the series but this is an auspicious beginning.